October 7th is World Day for Decent Work! To celebrate, domestic workers are gathering on our Facebook Page for a GLOBAL ALL DAY PARTY! – 7:00am to midnight. 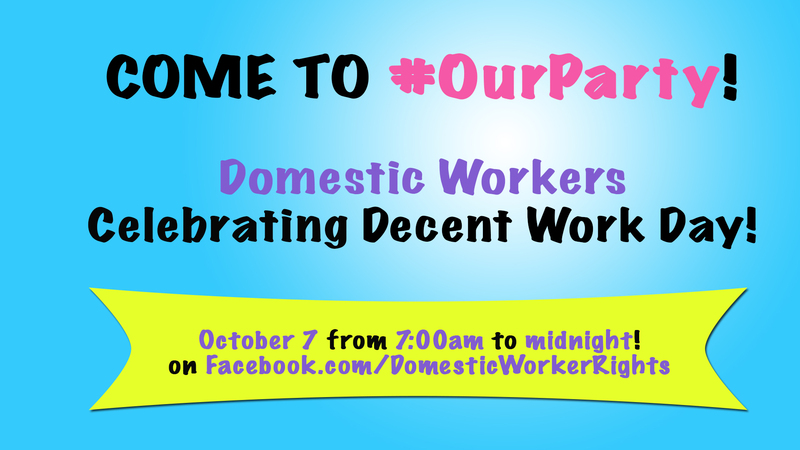 Just log on to the #OurHands Facebook Page – Facebook.com/DomesticWorkerRights – any time on October 7th! When? October 7th – 7:00am until midnight in your time zone! Why? To meet new friends, play some FB games, listen to music, and have a great time! RSVP on our Facebook event page and share with all your friends!! → Celebrate International Migrants’ Day on Facebook!